Pius Bamwange (R) the Onduparaka CEO alongside club chairman Benjamin Nyakuni and Hon Bernard Atiku the club patron receive a cheque from Martin Sebuliba (L) MTN Uganda's Senior Manager Brand and Communications during a press brief held at the MTN Uganda offices in Nyonyi Gardens in Kampala on Thursday 31st, January 2019. 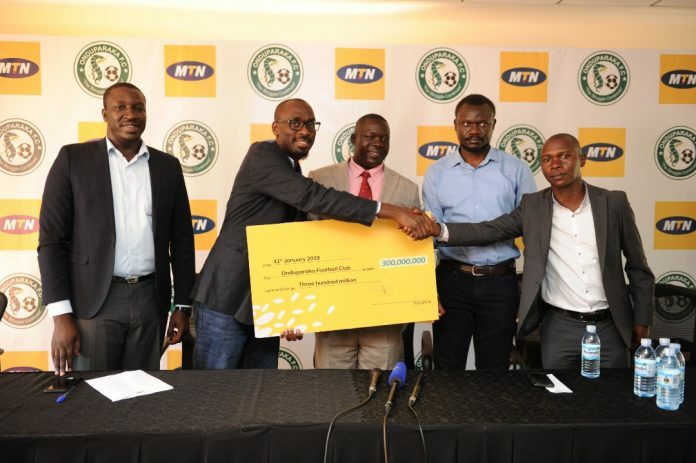 MTN Uganda has announced a UGX300 million (roughly USD$81,962) renewal sponsorship to Arua-based football club, Onduparaka. This sums it to UGX690 million (roughly USD$188,512) since the telco started sponsoring the club in the 2017/18 season. The renewal of the contract will see MTN become the title merchandise partner on all the club’s kits for the 2019/2020 season—and have its logo appear at the front of the club’s kit. Onduparaka’s Chairman Benjamin Nyakuni noted that the sponsorship will continue to enable the club to keep growing and meet some of its financial obligations. “We deeply appreciate the willingness with which MTN has and continues to sponsor our efforts towards making our region proud and supporting young people to attain their highest potential through the beautiful game,” Benjamin told press, on Thursday Morning at the MTN Offices in Kampala. MTN Uganda’s Senior Manager Brand and Communications, Martin Sebuliba on behalf of Wim Vanhelleputte, said, the club’s consistency, fan base and success in the Uganda Premier League remains attractive for their sponsorship package. 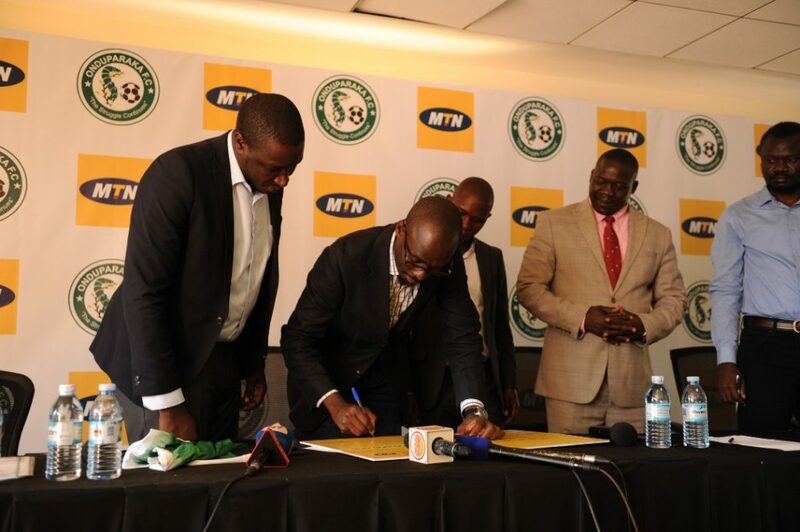 Martin Sebuliba, MTN Uganda Senior Manager Brand and Communications signs the cheque to symbolize the sponsorship. This was during a press brief held at the MTN Uganda offices in Nyonyi Gardens in Kampala on Thursday 31st, January 2019. “It was an easy decision for us to renew the sponsorship and become the merchandise sponsors,” he said. MTN has to-date committed to support supports in Uganda including athletes. 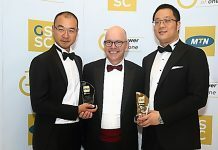 In the past MTN Uganda has sponsored the country’s National Teams in football and cricket, a club in the National Rugby League and the National Basketball League.